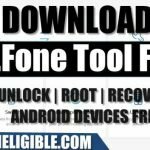 Download Miracle 2.54 with Loader and solve error (Access Violation at address), this is very good and latest software, that can easily be downloaded with just 1 click, you can solve multiple problems of your Android devices, whether it is FRP lock, IMEI Lock, Network Lock, Forgotten Password or Pin Code. 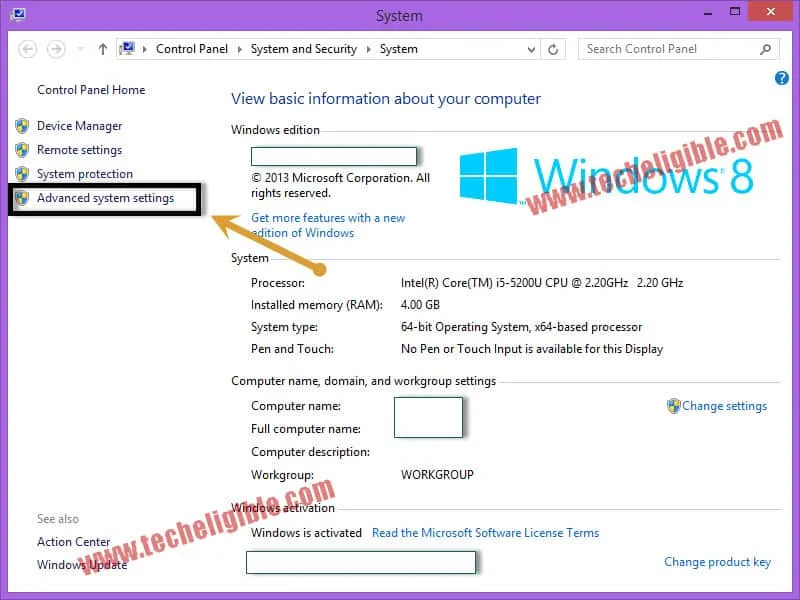 Note: The Access Violation error has been resolved successfully on “Windows 7 32/64 Bit” operating system, but you can try this solution with your Window as well. 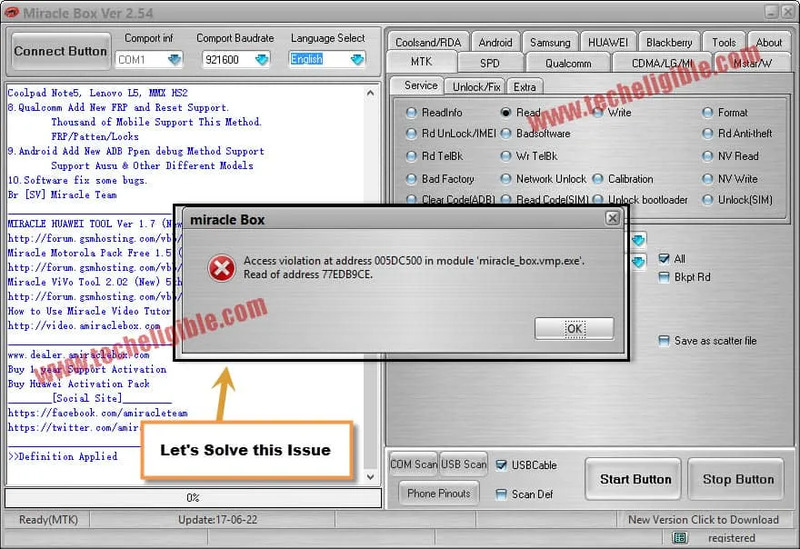 -Click below to download Miracle 2.54 with loader. Warning! : Turn Off any active “Antivirus Software” from your computer to avoid interruption while installing Miracle Software. -Extract download file from winrar archive. -Go to “Miracle Box_2.54” extracted folder, and then go to “Miracle BOX”. -Right click on “Miracle Box 2.54 Loader”, and run as Administrator. 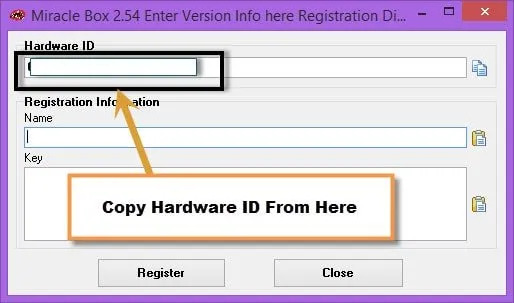 -Copy “Hardware ID” from popup BOX as shown in below image. (Keep Open this Popup Window). -Go to folder “Miracle 2.54 KeyGen“. 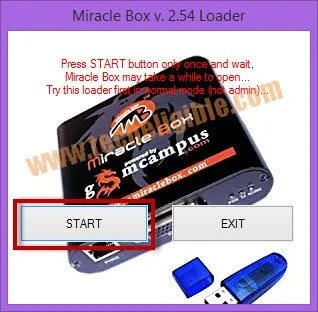 -Open “Miracle Box 2.54 KeyGen” application. -After that, give any name in “Name Field”. -Past “Hardware ID” in hardware id field. -Click on “Generate Key” Button. -Once “Key Generated” successfully, copy the “Generated Key” from box, see below image. -Go to the popup window where from you copied “Hardware ID”. -Past the copied “Generated KEY” in key box. -Give the same name in name field, that you used while generating Key. 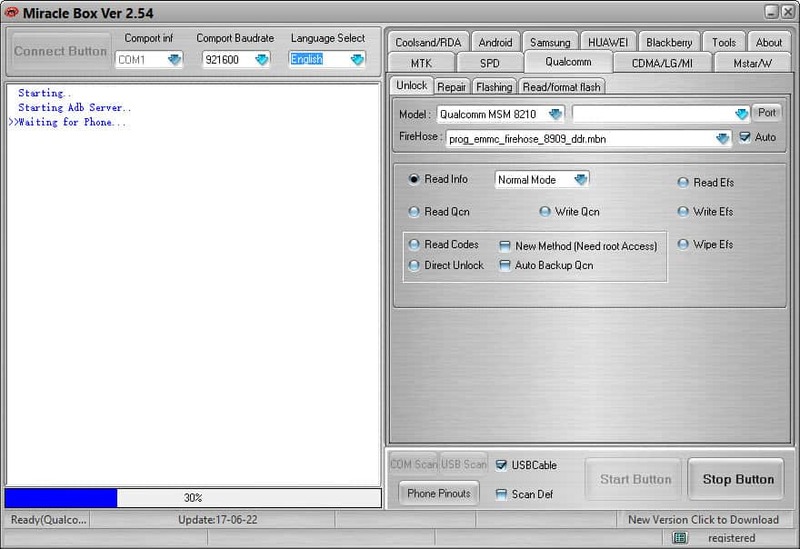 -After that, Click on “Register” to use Miracle 2.54 latest software. -Click on “START” from loader. -Wait until “Miracle 2.54” launch successfully. -Now, if you will click on “Start Button”, you will surely get an error “Access Violation at Address…”. -Right click on “My Computer” icon. -Click on “Properties”, after that click on “Advanced system Settings”. -Click on “Settings”, after that click on “Data Execution Prevention”. -Click on “Turn on DEP for all programs….”. (See Below Image). -After that click on “Add..”. 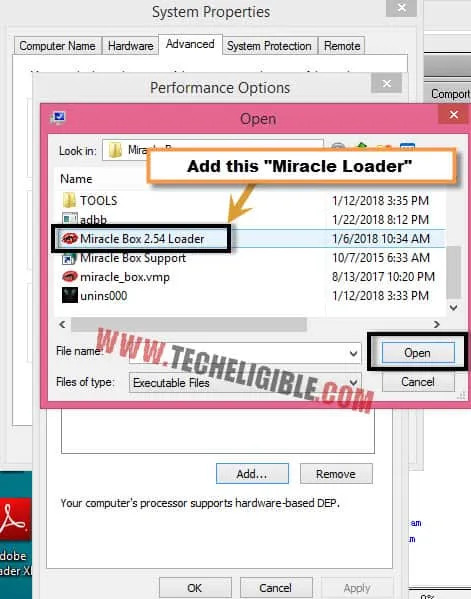 -Now give the path of “Miracle BOX_2.54 Loader” icon from the extracted folder of “Miracle Box_2.54”. (See Below Image). -After that, click on “Apply”, and then click “OK”. -Now you’ve restart your computer to solve “Access Violation” error. -After restart successfully, go to “Miracle 2.54 Loader” Folder. -Click on “Miracle Box 2.54 Loader” and run as administrator. -Now click on “START” button from popup window to run Miracle 2.54. -Click on “START” button from Miracle software and check “Access Violation” error is popping up or not. Note: If even then “Access Violation” is appearing up there, then this settings is not supporting your Windows Operating System, because this error has successfully been removed by following above method on “Windows 7 32/64 Bit Operating System”. -I would recommend you to get avail of this great miracle software by using Windows 7 Operating system. Thanks for visiting US, You can ask us any question regarding Miracle 2.54 Software in below comment box. is your antivirus on ? you can donate us by using your master card, but unfortunately the min limit is $20, through paypal you can donate even 1$ as well. 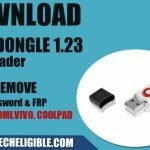 can i ask where to find folder miracle 2.54 key gen?